American painter specialising in animal subjects. 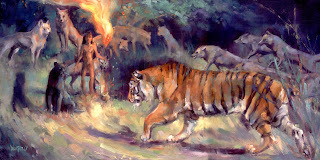 Two paintings from this blog page, based on "Mowgli's Brothers". Painted for a show at Galerie Daniel Maghen, Paris, in July 2012.